Late Tuesday morning we boarded the van at NOBLE/Organize!Ohio offices and headed to Columbus for the Medicaid Expansion rally. Knowing in advance that the politicians of the House and Senate were on their respective breaks, I did not think this was going to be much of a trip. The rally was being held indoors in the atrium of the Capitol, which in hindsight should have sounded off bells and whistles. After taking the elevator to the first floor, we approached the entrance to the atrium and immediately ran into a wall of humanity. Our small group, obviously on time but last to arrive, resolved to sitting on the stairs outside of the atrium proper where the speeches could be heard. So, to the mezzanine I headed where other shutterbugs had camped out the best vantage spots for snapping off mega pixels of pictures. (Editor's Note: This must have been the same spot with the Associated Press since it is almost the exact same picture). When I approached my peers at the rail, an amazing thing happened—the wall of shutterbugs parted and I was motioned to a newly cleared rail spot so that I could take my turn at snapping off several mega pixels of images. I got there just in time to document the reason so many suits were there. 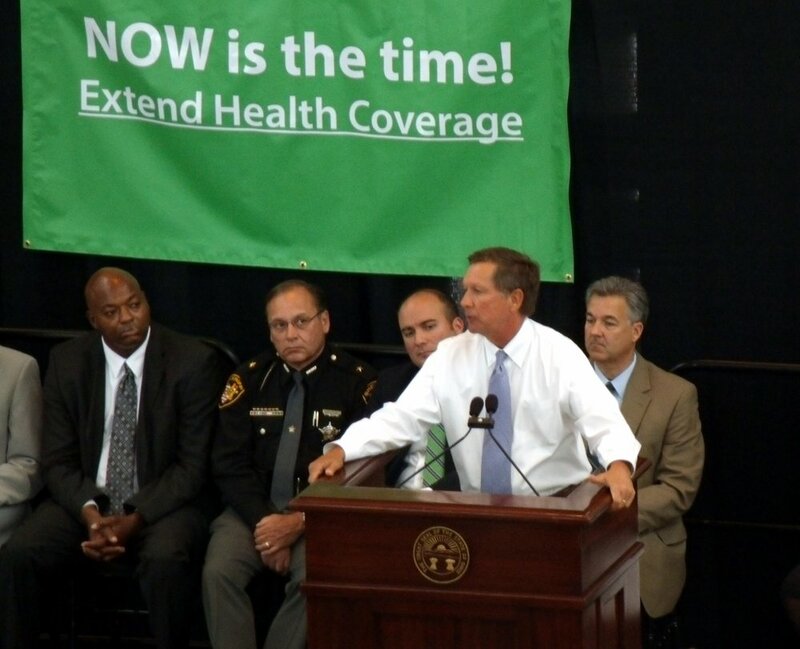 Ohio’s top elected official, Governor John Kasich was being announced and most of the onlookers were happy to be joined by a conservative who supports the expansion of Medicaid. All levity aside, after lobbying for Medicaid expansion in recent months with the knowledge that the Governor supported the expansion of Obamacare in his budget, he was clearly disregarded by his own party. It was fitting that the Capital atrium was filled wall to wall with many organizations, individuals, and elected officials that lobbied for the expansion and to have the Governor address those that have supported him through the process. The Governor’s speech was well received and the contents were exactly what everyone wanted to hear from him. Kasich said that he was not done fighting and urged the crowd to continue to push their legislators. He did not disappoint anyone in our delegation or any other group that worked hard but so far unsuccessfully toward passing the budget with Medicaid expansion included. NOW is the time to get this done!